What To Do With Used Christmas Cards: Declutter, Upcycle Or Donate? 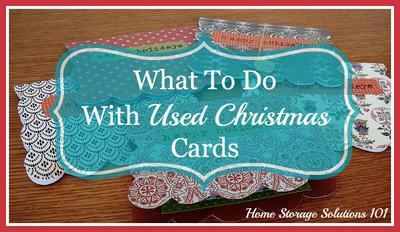 What To Do With Used Christmas Cards: Declutter, Upcycle, Donate? 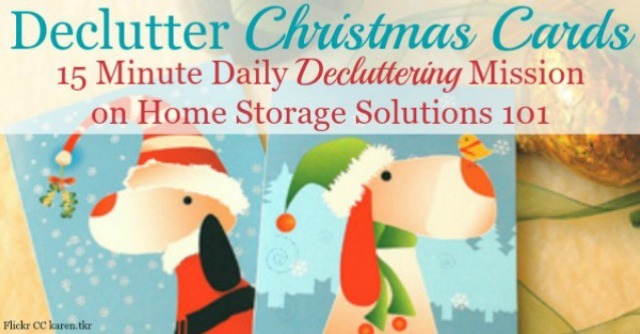 One of the daily decluttering missions here on the site is to declutter used Christmas cards sometime after the holiday each year, typically in early January. While this task may seem easy to some, there are typically a lot of questions and comments each year about this mission from participants in the Declutter Your Home In 15 Minutes A Day Missions. I believe the reason for that is because these cards, like all greeting cards, really represent more about the special relationships we have with our friends and family than the cards, themselves, would seem to otherwise indicate. That doesn't negate the fact, however, that after Christmas is over we often have a huge stack of cards laying around on counters, or covering the refrigerator, and they really become clutter instead of something to enjoy anymore. Therefore, here's my advice for what to do with them after the season is over, plus additional suggestions and ideas from readers. Before you declutter, up cycle or donate your cards make sure you look at each person's contact information that came with the card to make sure you've got their most current address. Make sure to update the contact information you find in Christmas letters, return address stickers, etc. so that you have the most current information for your friends and family whenever you need it. Next, lots of cards these days are photo cards. If you don't know anyone in the photo you really need to feel OK with tossing it. a great way to keep treasured memories. Instead of throwing these away I suggest saving them with your other photos. After you cull out these few special cards or items what you have left are mainly stock cards with a signature, at most, from someone. These are not something you need to hang onto indefinitely. We'll talk about this more below where some readers have shared ideas of what they do with old Christmas cards, which can have very cute or pretty pictures on them. Basically, this is a craft option. It might not be the best option for you if you don't actually take the time to make the paper crafts suggested, because then you're just left with craft clutter instead of holiday clutter. If the idea of throwing them out just really bothers you, but you know realistically you are not going to get all crafty with these cards this may be your best option. So where can you donate Christmas cards? I've written an article on this topic because so many people just really don't want to throw them in the trash. Join in and write your own page! It's easy to do. How? Simply click here to return to holiday clutter. We save the childrens/parents and keep with the family calendar. It's fun looking back over the years especially for the children. The other cards I tear the backs off and put in my recycle bin, unless they are completely plain. If the card backs are plain I add to the pile in the kitchen to write my shopping lists on. The fronts my younger children don't craft with goes to school for the younger Reception class children to practice their cutting skills on. We do this with birthday cards also. The reception children (aged 4/5 in England) love cutting out little pictures to make their own new ones. Being backless also makes the teachers happy because they can just use / store what they need. Okay... I did this a few years ago. But, I put them into one of those giant popcorn tins that seem to get gifted at Christmas. Then, one year, when I was bored, I took them out. So many families share their stories and a family photo. Well, I made a scrapbook. It was a blast. I did it by family, not year. Collaged the photos, sometimes cut out a stamp or address on their envelopes. That sort of thing. It really made each family collage personal, and the cards more fun to look at. I was able to put a decade into one scrapbook by adding pages. I figure one decade is enough. Some friends had passed away. Other families moved, and I noted the address changes...etc.... AND it's all in one book that I can get out once a year and reflect on the blessings of the love and friendships that have been in my life. This HSS101 Reader said, "my family bought a red and green scrapbook and we put all the pictures that we get (cards) and put the year on the page. It is fun to look back and see how much kids have changed, etc." This isn't a craft blog, but I am aware that lots of people love to use old Christmas cards for paper crafts because of the pretty pictures many of them have on there. Karen says: Something I picked up from my mother when we take down the Christmas cards is that we cut out the pictures and words from them with decorative scissors to make gift tags for the coming Christmas. Then we use an empty card box to store them with the spare wrapping paper. Not only is this saving money but also recycling the cards. The scrap bits of card are put into the cardboard recycling bin. Many other readers have shared a similar idea. This is perhaps the most popular way to recycle these cards. Another reader said, for example: I save the front of the cards and reuse next year as gift tags. I live to match the card with the wrapping paper. No ribbon necessary! Kris Deters says: I pick the prettiest ones and use as a cover for my next year's Christmas time planning. Add a few sheets of paper, tie or bind with a ribbon and add some fun stickers. Keep your Christmas lists, events, meal plans tucked in your bag when the holiday season comes back around. Ang says: Sometimes I cut them out and make ornaments. Joyce says: We made a prayer book out of the photo cards this year. The family loves to look through it and remember fun memories we have made with our friends and family. Roberta says: I usually cut the front off the back if there is no writing on it, and I use any 1/2 of the card that is blank for a to-do list, grocery list etc. They are sturdy. Nikki says: I've not done this with Christmas cards, but with cards and tags after my first baby I cut out my favorite pictures and notes, glued them on construction paper and then covered that with contact paper to make placemats. My son (now 13) is embarrassed if I put them on the table, but I like them. Having casual Christmas placemats would be fun to have. Barbara says: We save the cards, slice the pictures into bookmarks, add ribbon! We drop them off at our Christian school for the library to distribute in the month of December! It is an advent activity for us, joy for others! You can make a fun box or container for the media center desk so the ribbons are waving for the give away!! Make Christmas labels, or even paste onto plain brown bags to make pretty homemade gift bags. The sky is really the limit for what you can do, craft wise. Just think long and hard before you save them all because if you never do the craft it is still just clutter! So what do you do with your used holiday cards? I'd love to hear from you with your ideas (and your pictures if you've got them) and I'll add them to this page. You can share your ideas here. I love taking the cards and making next year's gift tags with them. I cut them creatively. Sometimes I get 3 or 4 tags out of a card. Better than throwing the whole thing in the trash. I have recycled my Christmas Cards by giving them to a lady who collects for schools in my area. She also collects crackers, where the school reuse them. I save my cards and use them the next year as gift tags. Sometimes I can get 4 gift tags out of one card. I only save letters and photo cards. One year we made circle ornaments but the girls have outgrown those crafts. So throw away! They take up room. For the past few years I started collecting Christmas cards by writing a letter to the editor about what I wanted to do and announcing it in any organization I belonged to. Made arrangements with local library or businesses to collect them, made a box for each. Then cut off the fronts from the back and used glue stick to paste a small Christmas message from the Bible with the name of our church. I have been doing this 4 yrs and now getting 3,000 cards last year to distribute them to the local homes for abused women, nursing homes, women's prison. So few ever get even so much as one card. I do this so they know they are not forgotten and somebody cares. This project has grown so that others help me. So much fun to look at the cards as we prepare them for others. If you can get envelopes from a store that discards them, fine, if not, just use them as if they were a postcard. Be sure to put the glittery ones in something though. I punch a hole to the top left of my Christmas cards and keep them all together with a metal hoop. Bring them out every Christmas adding the new cards at the end of the season. I have two hoops for Christmas and one each for birthdays, anniversaries, etc. That way I get to see all of the cards my great grandparents gave me as a child every year at the same time. One year I took the fronts of the cards and cut each into 6 pieces and randomly hid 5 of the pieces. Each kid got the one piece and had to find the other 5 to make a complete picture. It was something different and they had fun. I save all the greeting and Christmas cards for 1 year. At the end I go through the cards saving those with sentimental notes, special occasion cards like "big" birthdays, communion, etc., and any card received from someone who may have passed. This way I will always have a last birthday, Christmas card, etc. from say my father who passed away this October. Then the Christmas cards come out as part of my decorations. The rest I give to my niece who's a school teacher. They make nice recipe cards. Cut to fit a box and write the recipe name on front and the recipe on the back. where could I drop them off locally? Postage is too high to send the cards to someplace at any distance. I'm trying to find someplace local that I could drop them off at. I have made gift tags from many cards. When I was teaching I used old cards for many craft projects. I tear off the card front, store them in the Christmas tote, and use them as a gift tag for next years presents. I have been just trying to donate them for years, finding a place to drop off location is not easy, and have not found any. St. Jude's Ranch just offers a mail in address. Costly, yes! I like to upcycle my old Christmas cards. If the picture side (front of the card) is not indented and has no writing on it, I cut the card apart and turn it into a postcard for sending next year. It saves money on buying cards and postage on mailing. I have a friend who make cards for Missionaries, so usually all of my cards go to her. A great ministry opportunity! My daughter went some old Christmas cards and made ornaments for me. Some are pyramids while others are linked. We enjoy these cards because she has included signatures. These are really special because most of the people have passed on. Unused cards - holiday, thank you, sympathy, etc. I love reading your uncluttered help & have vowed to start 1/1! As we unearthed some boxes, I'm finding unused cards (Hallmark,) 1/2 used boxes of thank you cards, etc. I did find 5-6 large boxes of Christmas cards that we donated to the Midwest Veterans Closet, but still have cards I'd rather donate than recycle. Happy New Year! For the photo Christmas cards I take s picture of it and use it as the persons contact photo in my phone. For Family and special friends I cut out the family picture and made a photo collage that I hang in the hall. Each year I layer on the current picture. When people come to visit they are excited to see their picture on the wall. Most nursing home do crafts activities. The coordinator of those projects will gladly use the front of greeting cards to make new one for residents or family members. This is an excellent art activity for day care facilities and elementary schools especially Pre K too. Even your small children or grandchildren can use the front of an old card and paste it on construction, stock or typing paper with a personal message inside. 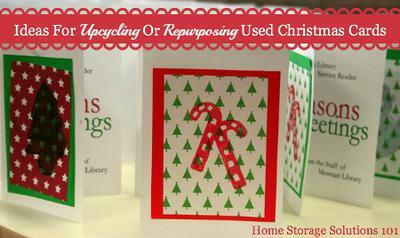 Enjoy recycling your greeting cards. Cut pictures, verses or signatures you like. Resend them as "Thank You" notes, or post cards. As bookmarks they can sit in a favorite dish, or envelope on your bookcase. Tuck them into books and magazines to be given or loaned. Write a note or stamp your return address on the bookmark. Give them to your children or older family members, church or school, etc. for crafts to be shared. Add glue, paper, scissors, etc. where appropriate - in a box or baggie for storage between uses. I tear off the back/message section and discard it. Then I stand the pretty card fronts (yes, pitch the one from your dentist with teeth on it) in a shoe box. When I wrap a gift I stick a specially chosen card front on the wrapping paper and use it as the To/From gift tag. You don't need fancy paper, solid colors look great, and the gift looks special. I save my favorite Christmas cards to kick start my decorating for the following Christmas season. I place a Christmas arrangement on a table in our great room and surround it with these cards. As new cards arrive in the mail, they are added to the table. When Christmas decorations are packed up, I cull through and save the ones I’ll use next Christmas. Where to drop off used Christmas cards. A school is a great option! As an educator we are always looking for items to craft with.